I interpret the phenomenal growth in both medical spending per capita and the number of administrators to the ever increasing regulatory burden imposed on the delivery of medical care by the government which now is responsible for more than half the total national medical expenditure. On the other hand, a fringe medical group Physicians for a National health Program sees the large increase in administrators as due to the lack of a government run single healthcare system. They believe that the Affordable Care Act will sharply increase administrative spending. They think that a government run medical program (a single payer plan) would sharply reduce administrative expenditures. They cite traditional Medicare, which runs about a 2 percent overhead. Were the 22.5 percent overhead costs they say will be associated with the ACA to drop to traditional Medicare’s level, the U.S. would save $249.3 billion by 2022. They’re right about the expense of the ACA, but are, in my opinion, in Dreamland when it comes the the costs of a single payer system. No one knows what Medicare’s true administrative costs are because Medicare doesn’t keep track of them. They offload most of these costs to other federal agencies, like the IRS, and to providers who have to run and pay for an enormous bureaucracy required to meet Medicare’s almost limitless unfunded mandates. The huge increase in the number of administrators shown above correlates with Medicare’s change in reimbursement rules about 25 years ago which required the large bureaucracy I just mentioned. But there’s no use in arguing about this, we can look at the data. The federal government has run a single payer medical system for decades – the VA. There’s no need to discuss the quality of care delivered by the VA as that subject has been covered in great detail recently. 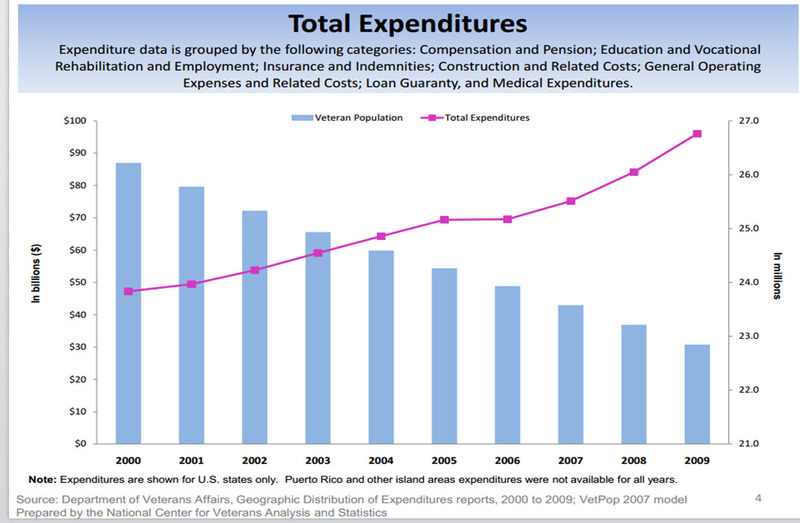 But examine the cost of the VA shown in the following illustration. Costs have almost doubled since the start of this century while the number of veterans has sharply fallen. And consider that only about 25% of veterans actually use the VA for medical care as most of them have private insurance and/or Medicare. 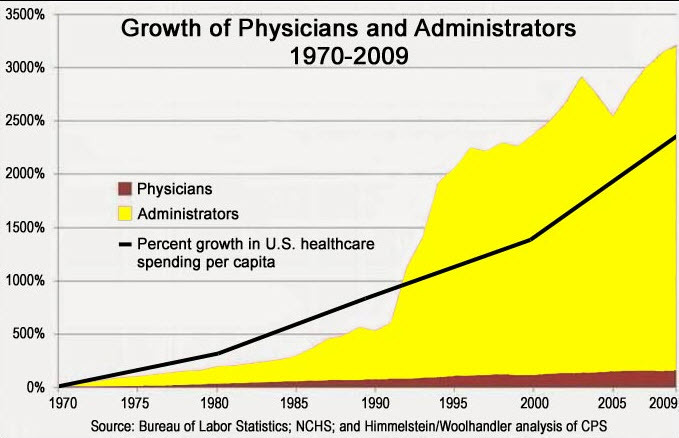 Thus, this single payer federal medical program spends more every year as the population it serves decreases. Draw you own conclusion as to what the cost of a federal medical program that covered everyone in the country would be. 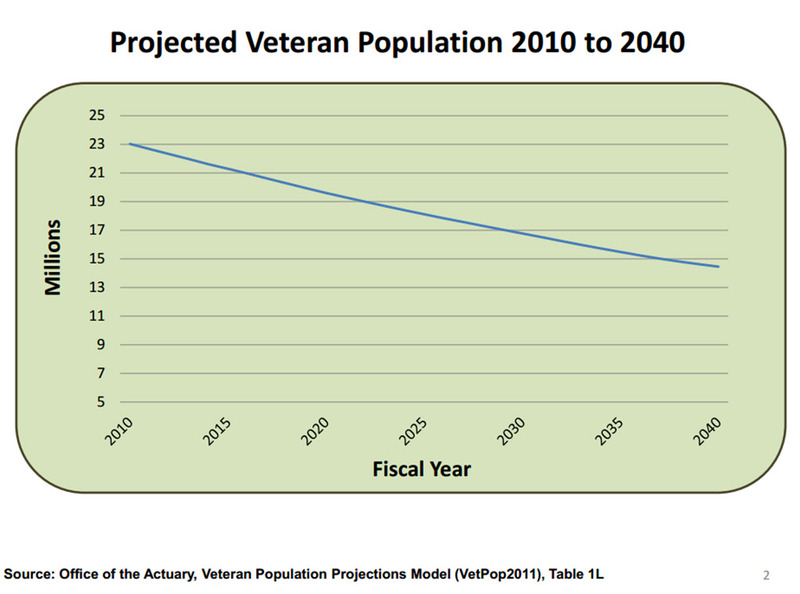 Shown below is the projected number of veterans over the next 25 years. If you were to bet, would you place your money on the side that predicts a corresponding fall in the VA’s budget? Furthermore, while the increase in the number of administrators is interesting, it is not as pertinent as what we actually spend on administration. As you can see total administrative spending is only 7% of the total medical bill. Getting administrative expenses to zero, which of course is impossible even for the famously efficient federal government, would have a limited effect on the nation’s medical bill. 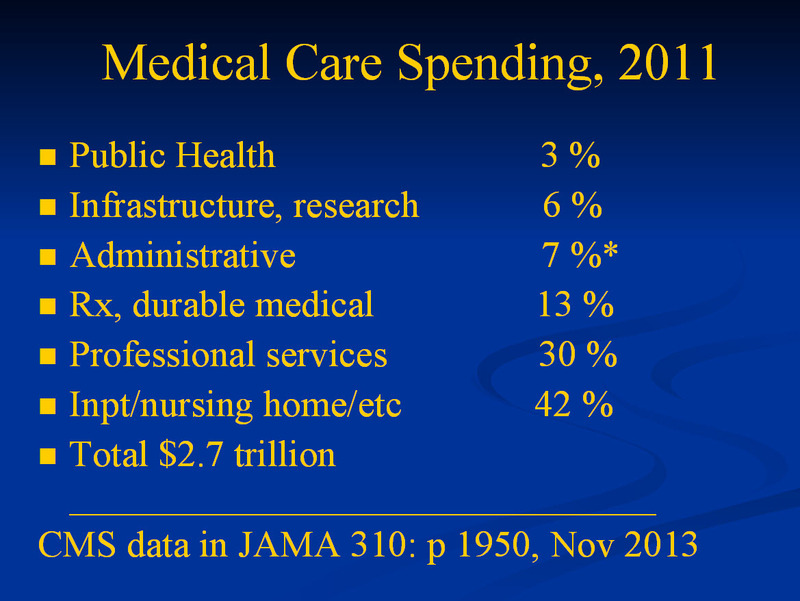 Most of the country’s medical dollar goes to physicians and hospitals. If you want to save money, that’s where you have to go. If any system is going to reduce medical costs there are only a few ways it can do so. All of which involve some form of rationing. It can ration by price, which means price competition among providers which drives down the cost of service. Look at what’s happened with computers. 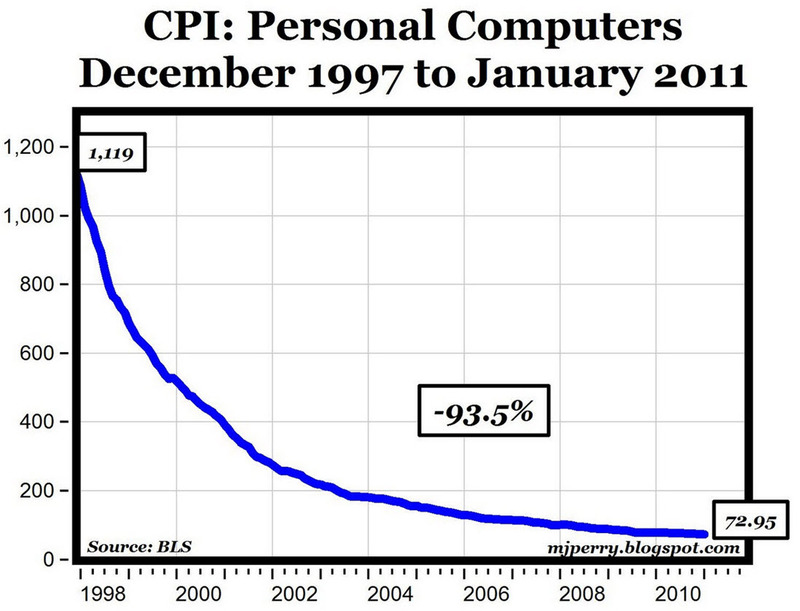 Price competition has crashed the cost of a computer while simultaneously increasing its performance. There being no price competition in medicine, better medical technology has driven prices into the ionosphere. With all the hospital advertising that pervades print and electronic media have you ever seen a medical ad that says come to us, we charge less? Medical and hospital fees are set by insurance companies and the federal government. They are the same among competing providers. The other way to contain costs is to ration by delay or denial. That would be the only way open to a federal single payer scheme. Arguing that a single payer plan can pay for itself by being efficient, ie reducing administrative spending, is delusional; the money is not there nor is the skill. When thinking about this issue stop for a bit and watch or rewatch Rashomon. Even if your attachment to government medical care is umbilical, the movie is a masterpiece and worth viewing regardless of the reason.